You are currently browsing the tag archive for the ‘crash’ tag. Last night we were on a train , heading home from a convention. We were only about ten minutes away from our destination when the train slowly came to a halt. We were puzzled by why we would be stopping, but eventually some police personnel made their way through the cars, demanding to see everyones documentation, and any valuables they were carrying. This seemed rather odd, but as it turns out, one of the passengers did not mention that he was carrying a sandwich. The police then proceeded to seize all sandwiches, and warned us that any hidden sandwiches will result in dire consequences. As we were waiting for the sandwich police to finish up, I stood outside having a cigarette – despite the fact that I don’t smoke. I watched a helicopter circle and then proceed to head in for a landing on a five-story apartment building. I watched the chopper slow down, descend, touch the roof of the building, slide off the edge and fall to the street, showering pieces of debris as it hit the ground. I ran over, there was wreckage strewn everywhere, bodies and pieces of bodies littered the street. Fire everywhere. Then, out of the main wreck, emerged a young woman, unscathed. She said “I’m fine, I’m fine.” and walked away. Everyone else from the aircraft was dead. The police from the train ran over, and arrested me for leaving the train. This one I have had numerous times. It starts out in my childhood home. As a kid I used to sit out front and watch airplanes landing at the nearby airport. They would fly right over our house, which is located in a quiet suburb, and the rear of the house backs onto a valley and a river. If you look in the distance from the front of the house, you could see the planes lining up, getting in position for the flight path to land. In this nightmare, I am sitting out front watching the airplanes, just as I used to. Except at this time, I am an adult, in the present day. 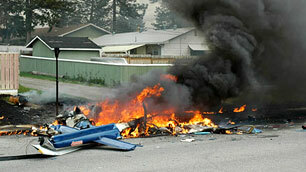 All of a sudden one of the oncoming planes spins out of control, and crashes in a massive fireball just down the street. There are bodies and parts of bodies everywhere. Total mayhem. Then the next plane in line does the same thing, crashing just beyond the first one. 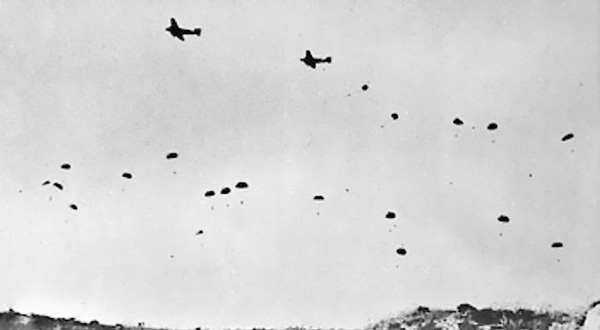 Then each of the oncoming planes drops paratroopers – nazi paratroopers . They are coming by the hundreds. I run inside, watching out the kitchen window now. There is gunfire all around me, houses are being blown up. They are shooting at me, coming up the walkway. I am shooting back – sometimes the fighting is so close I am stabbing chests and slitting throats. I show no mercy. As this is going on nazi tanks are coming from the valley behind the house. They are firing on the houses on our street, blowing them up and driving over them. A tank crashes through the back of the house. I am now in the basement, the tank is over me, and I attach some explosives to it. As it crashes through the front of the house, heading toward the street, it blows up. Screams of the crew can be heard. Good. We fight all night – I kill dozens and dozens – in a merciless and unemotional frenzy. I sever heads and place them on sticks – still wearing their helmets – to warn the others to stay away or I will kill them all too. After they have gained control I sneak around in the dark, killing each and every one of the guards by sneaking up on them and slitting their throats, or quickly twisting their heads and breaking their necks. No mercy. I have been through this nightmare enough times to know where they are, and where they are going. With this advantage I can intercept them in their travel, or sneak up and kill them. There is always lots of blood, and lots of guts. I usually win. In the few times I am about to die, I will wake up. Tired and exhausted from fighting all night long, the pain is very high. It’s never a happy ending, whether I win or not.